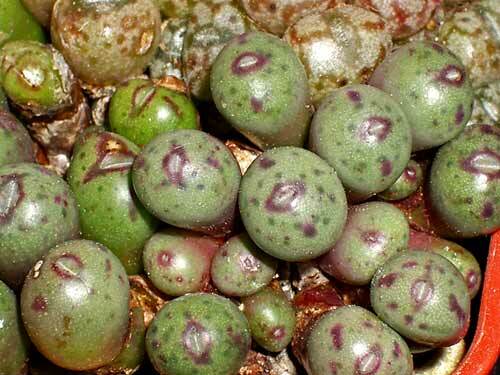 CONOPHYTUMS PUBLISHED SINCE "THE DUMPLING"
The wedge-shaped, bilobed bodies are about 6mm wide and shiny, light green in colour; the keels are usually outlined in red. The diurnal flowers are purple and it is probably a member of the tantillum/violaciflorum group. This was discovered a few km west of Gamoep by Anthony Mitchell many years ago and is named for him. 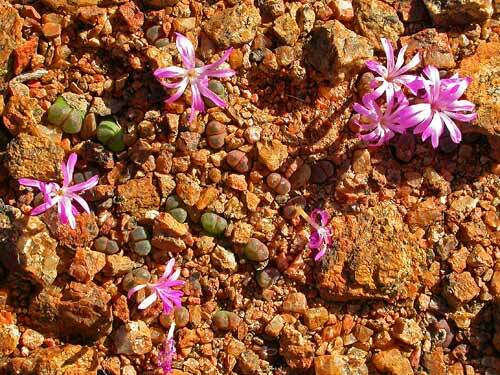 The authors undertook a revision of Conophytum reconditum and took the decision to reinstate Conophytum buysianum to species status. The flower of C. buysianum is purple rather than the white or pale pink of C. reconditum, but most importantly the flower of C. buysianum is produced from a tiny new head inside the current body, i.e. the head that would fully develop the following year. C. reconditum produces the flower from the current year's head in the normal way. Typical C. buysianum has bodies which are rough and brownish, whereas the new taxon, ssp. politum, has smooth bodies that are greener in colour. It is known from a few population to the SW of Kliprand and is said to be easier to cultivate than the typical subspecies. This taxon is based on the Harry Hall collection HH5141 from his own farm at Liebendal near Holrivier on the Knersvlakte. For many years this had been grown as C. minutum var. nudum but Steven decided to separate it from that variety on the basis of its larger size, concave apex and propensity to colour purple in good light. 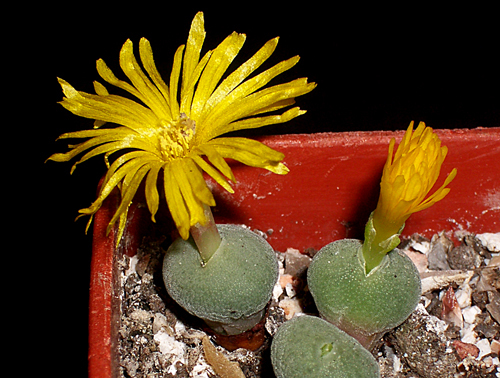 Conophytum nudum was originally described from Komkans, quite a way to the north, and is actually quite rare in collections compared to lisabeliae. I assume that Steven still regards other populations such as the one at Moedverloor to be the var. nudum. The name commemorates Harry Hall's second wife Lisabel who died in 2008. Among other things, she was responsible for naming several Bulbine species. Forms rounded clusters of very small, almost-spherical, unmarked heads. It is a member of the southern Minuscula section with the purple flowers typical of that group. 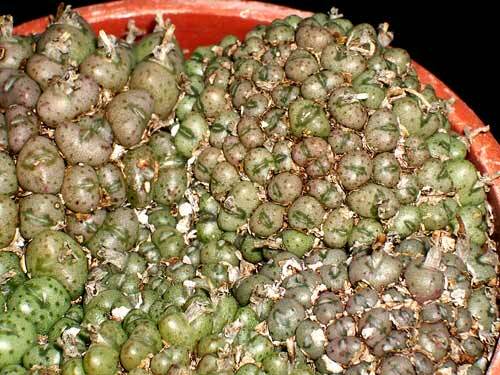 However the large seeds and geography tend to point to Conophytum albiflorum as its closest relative. It's pious nature is a consequence of it growing near to the mission church at Rietpoort, NW of Bitterfontein. Steven Hammer has said that plants can become more keeled under his conditions. This is a relatively recent discovery, having been found on a hill near Dassiepis, SW of Kliprand, in September 2007. Dassie is the local name for the small animal, the hyrax, which has provided the plant's specific name. It forms open clusters of small truncate cylindrical heads, grey-green in colour, with red lines on top. A batch of seedlings has shown quite a bit of variation in apical markings and hence relative attractiveness. The diurnal flowers are rather delicate, with long pale tubes and pale purple petals. 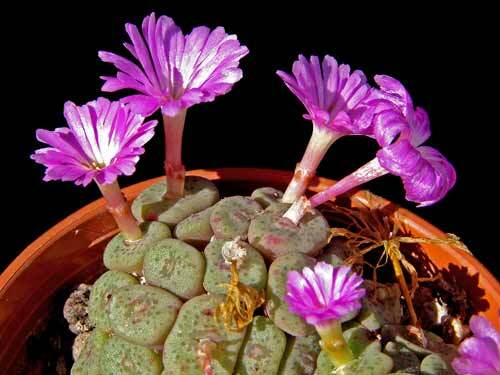 To me, it looks like a miniaturized form of Conophytum chauviniae which occurs not far away. This is an amazing new discovery by Chris Rodgerson, Andy Young, Alice and Alan Vanden Bon, that was made very close to civilization in the Garies area. It is almost certainly related to two members of Section Cylindrata: C. rugosum and C. roodiae ssp. sanguineum which grow nearby, but differ from those in having large light purple flowers that appear in spring. 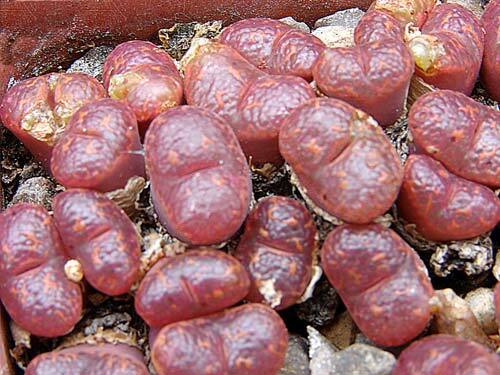 This feature in combination with the red-brown verrucose bodies would make it a popular species in cultivation but I fear that it might be as difficult to grow as its two relatives mentioned above. The plants occur on a black-lichen-covered granite (gneiss) hillside and are very obvious in flower. However Andy visited the locality in the following South African spring and had trouble locating the plants. This crypticity is probably the reason that it has remained unknown until now. This is another new discovery from the Rodgerson, Young, Vanden Bon team. It was found in the Groendoring River valley to the north-west of Kosies and appears to be rather limited in its distribution, although travel and exploration in that area is difficult. It seems to belong to the northern Minuscula section in a group of yellow-flowered species that includes C. irmae, C. auriflorum and its ssp. turbiniforme. The nearest of these geographically is C. irmae, but that is a very much smaller species with slightly-ridged bodies. C. auriflorum ssp. turbiniforme is somewhat similar morphologically but has more pronounced spots, is more convex on top and is very much more vigorous; furthermore it grows about 70km away. Therefore it can not be included in any of the existing taxa and will be published as a new species. 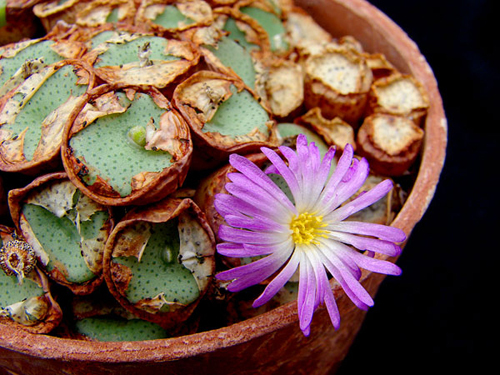 It does not present any problems in cultivation and grows well from seeds and cuttings. However, it is fairly slow in forming large clusters. In 2008, two of the authors visited the hill where C. bachelorum is known to grow and discovered a population of plants which appeared to be that species, took photographs and happily carried on with their field trip. However subsequent observations on plants in this population revealed that the flowers were produced in early autumn (not spring as for C. bachelorum) and that they had dark centres similar to C. obscurum rather than the pale-centred flowers of C. bachelorum. There are actually the two populations of distinct but similar-looking conos less than 2km apart on the same hill. The confusion over the identity of these plants has led to the specific name that they have been given. It is interesting that a matching pair of species C. chrisocruxum and C. chrisolum grow close together on a hill not very far away. 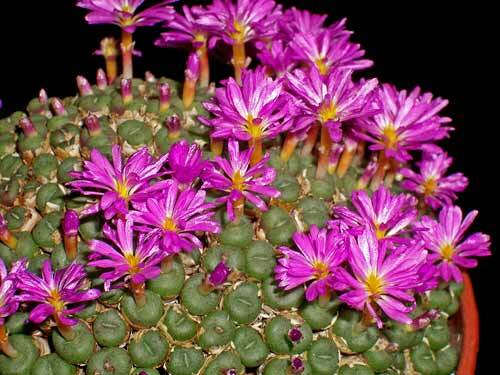 It does not seem to present any problems in cultivation other than being rather slow from seed. The heads are somewhat smaller than those of C. bachelorum but it clumps a little more freely. It does not seem to flower as readily as one might expect. When this was first seen in the wild by Derek Tribble in the early 2000s on a quartzite ridge to the south-west of Steinkopf, he thought that this also might possibly be the then long-lost C. bachelorum. However, it lacked any of the brown pigmentation of that species and rather than being flat-topped, the centres were particularly depressed. 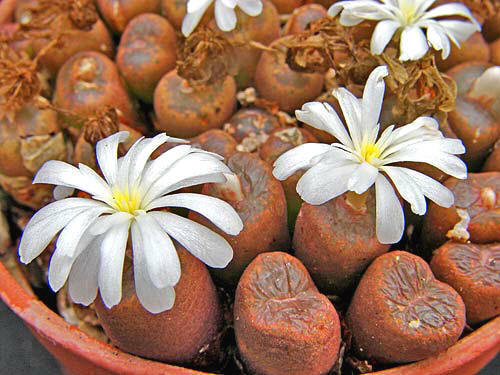 For many years this has been regarded as a local form of C. wettsteinii which is commonly found in the same area, but the authors also consider it related to C. francoiseae. The concave top surface combined with the unusual brown "raised-pie" resting sheath has prompted the authors to name it as a species in its own right. It has been cultivated for many years and is easy to grow and fairly-readily available. Whilst botanising an area near Kosies with friends in 2015, Young and Rodgerson found a population of this variety growing on a low quartz hill. The normal var. noviceum is very common in that general area but that has glabrous (smooth) bodies. Close examination of the newly-discovered population showed that the bodies were velvety, due to a covering of short trichomes (hairs). This feature becomes very obvious when pieces of the epidermis are put in the scanning electron microscope. On this basis they gave this restricted local ecotype the varietal name kosiesense after the near-by hamlet. The var. noviceum rapidly forms big clumps in the wild and cultivation. However the new var. 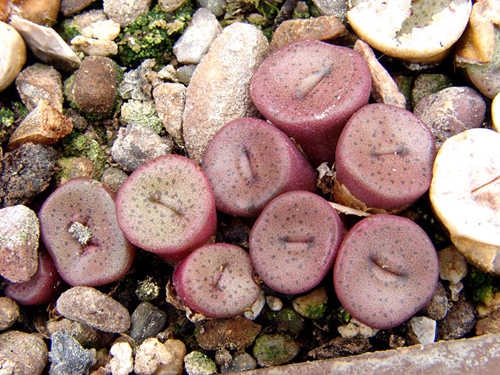 kosiesense has an average clump size of only 20 heads (exceptionally <50) in the wild and is slow to multiply in cultivation. 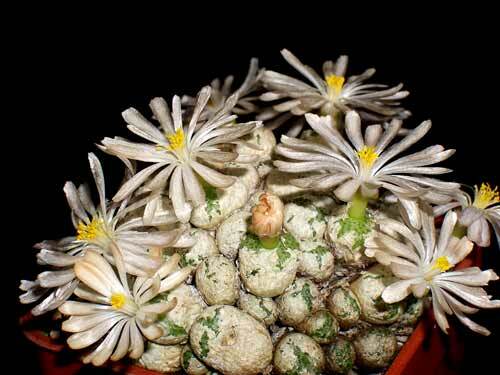 In view of the variability of many Conophytum taxa it is debateable as to whether this local form was worth naming. 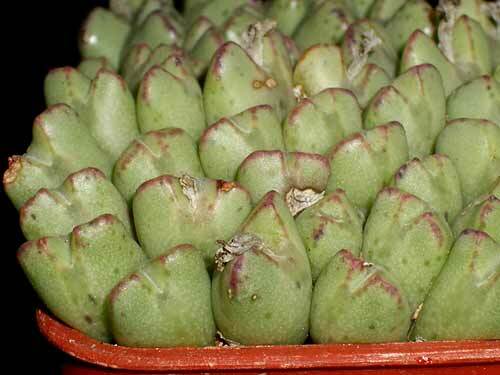 For many years, I have grown a stock of Conophytum bilobum ssp. altum that had originally been collected by Rolf Rawé 10 miles north of Aughrabies. When I started propagating plants for sale, I pollinated my stock to produce seeds. Seeds were duly sown and when they flowered, there were the expected yellow flowers but also a vigorous plant with bright orange flowers with yellow centers. The shape of the bodies was as a normal altum and the internodes were somewhat elongated as expected for that subspecies. For most mesembs, an orange flower colour is indicative of a cross between a yellow and a purple-flowered species, so I am fairly sure that this was the result of pollen from a purple-flowered cono being transferred to my altums by a rogue insect. In my early years at the North Surrey Branch of CSSGB, there were two excellent mesemb growers who inspired my interest in the family: Betty Maddams and Adele Whicher. I christened a red-flowered bilobum hybrid of unknown origin for Betty in 1988 [Mesemb Study Group Bulletin (1988) 3: 25] and this bilobum hybrid for Adele more recently. The only hill north-east of Eksteenfontein where C. cubicum is known to grow, also harbors populations of C. jucundum at a lower altitude, but they are not known to intermingle. 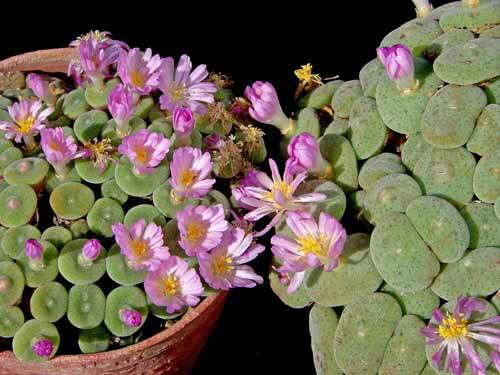 Information from people such as Petr Pavelka who first discovered the species, indicates that the cubicum population mainly produces the exceptionally large white flowers that are characteristic of the species, but about one in ten plants are purple-flowered. This cultivar name has been established for the purple-flowered plants. In addition to the flower colour, they can often be identified by their slightly greener, slightly less cubic, bodies, although some have bodies indistinguishable from the norm. They almost certainly originate from flying insects introducing some jucundum genes into the cubicum population. It works the other way too; I have a plant of purple-flowered C. jucundum from the hill that has the enormous long-tubed flowers characteristic of C. cubicum. My stock of the cubicum cultivar originated from seeds produced by Steve Hammer crossing a white with a purple-flowered parent. When the seedlings flowered, about half of them were white-flowered and the purple ones were segregated and propagated from cuttings. Conophytum fulleri is very widespread in eastern Bushmanland on quartzite hills such as Gamsberg, Houmoed se berg, Namiesberg, etc. I have personally seen many hundreds of plants of this species in flower at various localities and they have been uniformly purple in colour. Some years ago now, John Lavranos collected some C. fulleri plants from a hill south of Namies that few enthusiasts have visited and sent them to Chris Rodgerson under his number Lav 23863. Amazingly one of Chris’s plants turned out to be an albino when it flowered and he subsequently distributed it under the description of “clone with white flowers”. The body is similar to other fulleris, but the flower is what I initially termed as “dirty white”, much to Chris’s disgust. More accurately, it is white overlaid with buff, particularly towards the tips of the petals. Chris generously gave cuttings to many of his friends and it has appeared on his sales lists for over 10 years. I established the same ‘Chris’s White’ in his honour when I first distributed it in 2010. 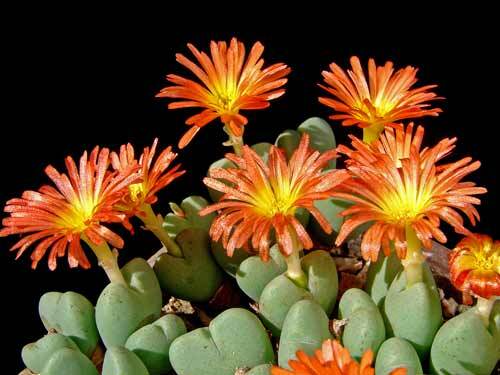 Conophytum ernstii was originally discovered by Ernst van Jaarsveld on the Sandberg, which is a hill in the Richtersveld by the southern bank of the Orange River. Somewhere in the Sandberg area Sean Hogan, a Californian plantsman, discovered a plant of C. ernstii that had very small heads: about half the size of normal ernstii. He gave a cutting of this to Steve Hammer. Steve Hammer himself found two plants of a small form hiding in the middle of a large population of C. jucundum away from the type ernstii population on a smaller peak to the west. He collected cuttings and produced seeds by inter-pollinating the three clones. I raised plants from some of these seeds and they were 100% the diminutive form. Plants are essentially the same as normal ernstii apart from the reduced body size and shorter salmon-rose petals. Body size alters with plant maturity; vigorous youngsters are normally much larger. The difference in size can be seen by comparing mature plants of the standard and small form in the accompanying photo. The name is obviously derived from Dean Swift’s land of the little people. 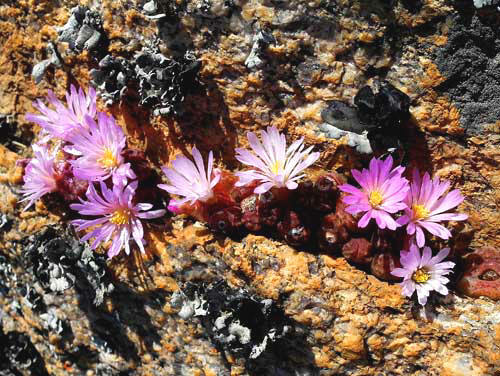 The parent species, which is purple-flowered, is only found on the hill Kouberg in western Bushmanland. Around the year 2000, I was given some seedlings of koubergense by Frank Trigg and when they flowered I noted that two of them were white. I do not know where Frank's seed came from, but in body and flower form they are identical to purple-flowered plants and I have no reason to suspect hybridity. I found that the white-flowered plants could be crossed together to give white-flowered offspring and I therefore now have quite a few clones of this cultivar and they all share the cultivar name which was established for the white-flowered variant. The name is a not-very-good pun on the species name and locality. "Lith" means stone in Greek and "koue" means cold in Afrikaans. I chopped up my plants in 2015 and distributed them to various countries in the autumn of 2016. Also round-about the year 2000, my Belgian friend, Tom Jacobs, gave me some cuttings of this clone which had originally been raised from seed of the 'Pardicolor' ecotype of C. pellucidum that had originated from Kweekfontein in western Bushmanland. It can be seen from the photo that this clone has bodies that are a rich red-purple in colour rather than the usual browns of 'Pardicolor'. However it does not have the colour intensity of 'Makin's Plum'. The flowers produced by this single clone are the usual white with yellow centres that are expected for the species. The flag of the municipality of Antwerp is white and red in colour, so the cultivar name pays homage to its city of birth and the colouration of its flag. It took me 15 years to build up enough material to be able to release this vegetatively-propagated cultivar in the autumn of 2016.